Porec is just 40 minutes by car from Rovinj. An easy drive, very well sign-posted and definitely worth it to see this lovely Roman town which juts out into the blue Adriatic. We found a parking space close to the centre and set off to explore. Porec is probably the most popular resort in Istria. The marina with its flashy boats is a good place to start. We strolled around, Son played on the shingle beach and paddled in the sea. Check out that water again – crystal clear. Tito planned to use resorts like Porec to draw in much needed currency from all over Europe. It worked and thousands of visitors came. The war dented tourism, but left no physical damage. 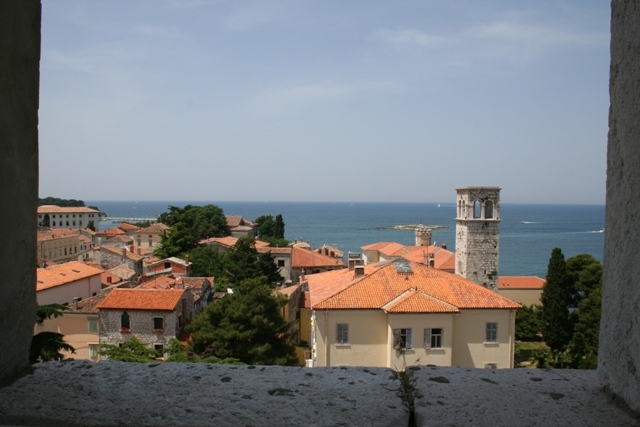 Today Porec is again a busy resort with plenty of cafes, bars, restaurants and boat trips. 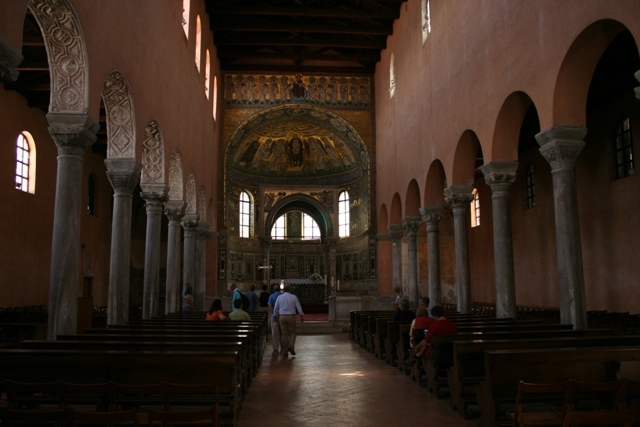 We easily found the Basilica of Euphrasius – the main reason to visit. This is Europe’s second oldest basilica, built in the 6th century it has glittering mosaics, marble columns imported from Constantinople and fine sculptures. It is UNESCO protected, extremely well preserved and an absolute must see. Inside it is quiet and atmospheric. 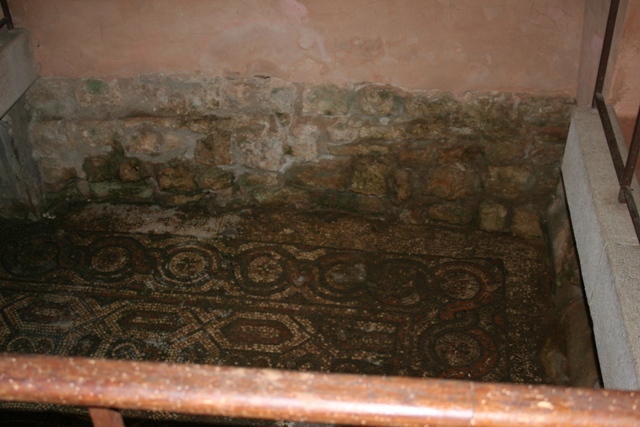 We saw older mosaics near the main door that have been uncovered below floor level. These date to the 4th century. The wooden pews on the other hand are positively modern – they just date from the 15th century! 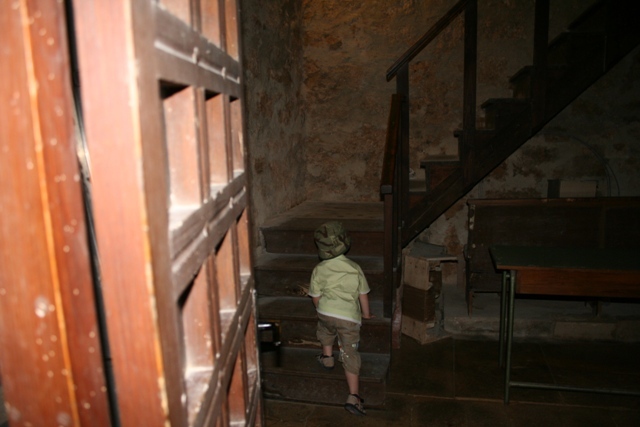 Son spotted steps to climb and was off like a rocket. There are 120 to be precise taking you up to the steeple. Well worth the climb and the small charge for the panoramic views of Porec and its environs. Basilica done, our afternoon was spent wandering around the town. We stopped for delicious pizzas in the main square, then loitered in the narrow streets and alleyways. 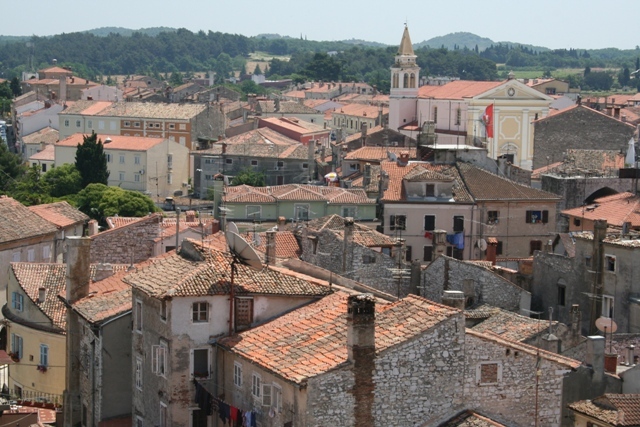 The town is small but perfectly formed and picturesque with its red roofs and cobbled streets. Towering above everything, wherever you go is the campanile. We found an aquarium in the centre and paid to go in. Big disappointment – just one little room and we were done in 5 minutes. Add to that dirty tanks and the saddest array of sea creatures ever – we should have given it a miss. Son liked it though. On the way back to Rovinj we took the coastal road and found Limski Fjord. Lots of boat trips take tourists here from all the resorts, however coming upon it on our drive back was an unexpected treat. We parked right at the water’s edge. Peaceful, quiet, lovely vistas and more of that amazingly green-blue crystal clear water. That really is properly clear water. 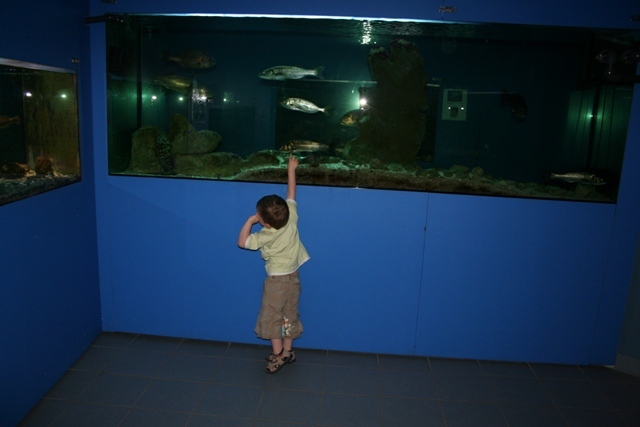 It’s funny about kids and aquariums. For the longest time we were calling our local pet-shop-for-goldfish-owners “The Aquarium” and billing it as a major attraction and it actually worked very well, and probably still would if we found ourselves going past these days. Mind you, we never paid to see it. But I can definitely imagine your son seeing any old fish tank at all and thinking it was tops, even if you guys were seriously unimpressed. I love the boats in the last photo, by the way. We did a similar thing with our local pet shop – worked a treat! Thank you … it was! Porec is one of those places I quite fancied when it first hit the tourist circuit, then it seemed to get a bit of a bad press for a while. I would always have been game for a look though, Joy. Different things appeal to different folks, don’t they? And it looks rather nice to me. You can always get away to quieter places. Lovely little chap, your son 🙂 Happy days! We enjoyed our day there but I know what you mean Jo. The church is interesting and it was uncrowded during our visit so that makes a difference. It is a lovely place to see, but I was glad we decided to stay in Rovinj, it beats everywhere else hands down. The below-floor mosaic is amazing. Beautiful and blows your mind to think it’s from the 4th century. Hi! 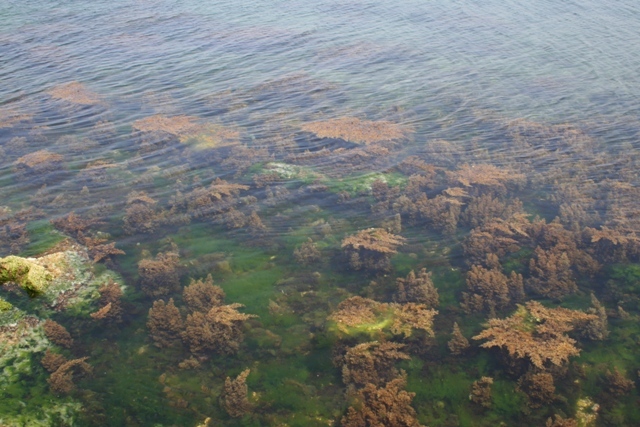 Love your blog…especially your section on Croatia. My father was born in Fiume (now called Rijeka) when Istria was still part of Italy. After WWII the Italians were forced to leave, therefore he grew up in Trieste. So of course I am intrigued with all of Istria. There is a great old Italian folk song called “La Mula di Parenzo.” sung in the local Italian dialect. The song talks about a girl from Porec. Porec used to be called Parenzo. I grew up listening to that song. ANYWAY…Istria is beautiful. About 7 years ago we went to Rabac and it was lovely. Thank you for visiting my blog and for reading!! 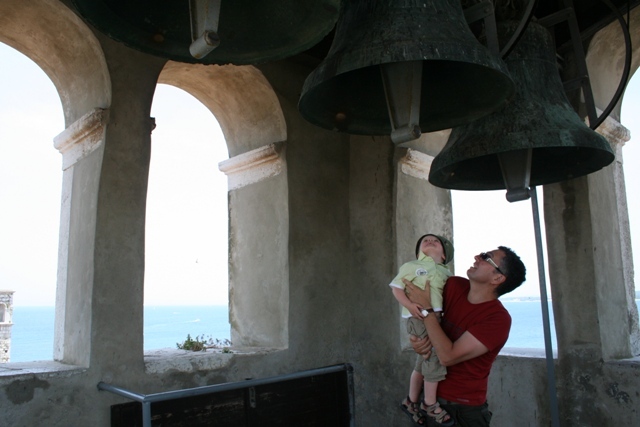 It must be wonderful to have a family link with such a beautiful and interesting place as Istria. 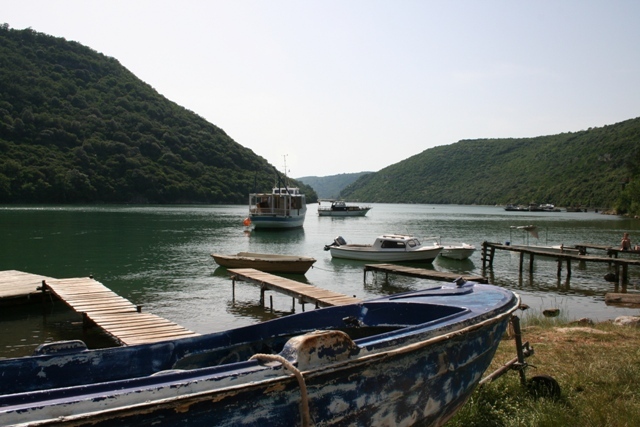 We loved it there – didn’t get to Rabac, but would really like to go back again some day.